Hi, I am interested in your 1970 Mercury Cougar (stock #1073-NSH) listed on Autotrader for $29,995. I'd like to get more information about this vehicle and confirm its availability. This car is the last of the performance-oriented Cougars. It established the image that would stick with the brand before they started sliding more toward the luxury end of the spectrum. 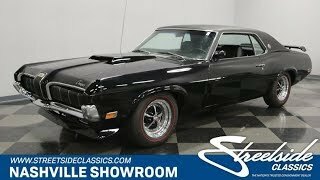 Its a serious Pony car with a powerful 351 Cleveland and unique styling that distinguishes it from the crowd with a set of taillights that would become iconic. Check it out. This car is gorgeous in Black and chrome! From the side you can see the aggressive, angular cut to the body with its tapered nose, deep chin spoiler, bulging rear fenders, and a wing mounted up in the air flow on the trunk. Up front that unique grill has a super clean look with vertical slots in black and chrome concealing hideaway headlights. The center section of the grill feeds back into a hood scoop that leaves little doubt about what this cars intentions are. The front fenders have a crisp and clean upper edge that bends down over the front, framing the grill and blending into the sharp looking bumper. A black vinyl roof contrasting with the glossy black paint makes the car look even more low and lean. The back of the car looks awesome with a set of taillights that became an instant classic and have become copied and mimicked to this very day. Open the door and you will be treated to a nicely appointed Black interior that incorporates upscale touches without losing its performance orientation. The door panel sets the tone with a simple door pull strap at the top with a rectangular patterned center section. Then you find rocker switches for the power windows and locks just over the grill for the stereo speaker. High backed bucket seats are comfortable and there is a vinyl wrapped three spoke steering wheel with a Cougar prowling across the center. Behind it is a stock dash board nicely dressed out with a wood grained look. There are four large gauges with the speedo and the tach in the center flanked by the fuel and engine gauges on either side. More rocker switches control accessories at the top of the center console with vents for the air conditioning system just below them. A T-handle shifter for the automatic transmission rises from the center console and there is a nice armrest with storage compartment under it. Pop that hood and you will find a healthy 351 Cleveland motor nestled down in the engine bay. 1970 was the first year that this engine was available in the Cougar, and this car is believed to still have its original motor still nestled down in the engine bay. An oval Edelbrock air cleaner has a finned, black and brushed aluminum air topper which matches the black and brushed aluminum valve covers for a really great look. Even the A/C compressor matches with a finned cover on it. There is a Holley 4-barrel carburetor feeding the stock Cleveland intake and heads with long tube headers getting the spent gasses out and headed back through dual Flowmaster mufflers. Power steering and a beefy front sway bar provide for good handling and power front disc brakes let you haul this car back down from speed with confidence. The car sits on Magnum 500 wheels with 215/70R15 red line tires all around. A muscle car that you dont see every day. Powerful, good looking, and comfortable. Come on down and check it out. You may decide to take this Cougar home and then out on the prowl.